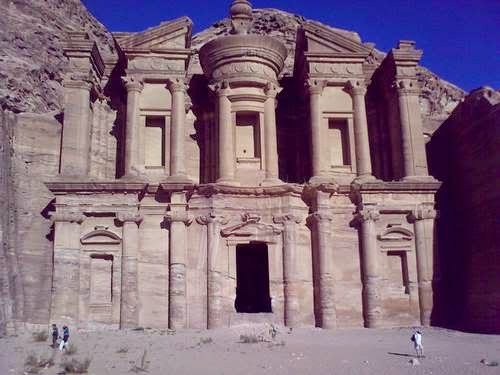 Deep within the deserts of Jordan lies the ancient city of Petra. Through a narrow gorge it emerges into view, revealing awe-inspiring monuments cut into the surrounding cliffs. What is this astonishing city? Who built it, and why? Two thousand years ago, Petra stood at a crossroads of the ancient Near East. Camel caravans passed through, loaded with spices, textiles and incense from distant regions--and through such commerce, the city flourished. Its people, the Nabataeans, harnessed precious water, enabling the population to soar to perhaps 20,000. The Nabataeans also erected monumental tombs, memorializing their kings and leaders. But over time political control changed, and so did trade routes. Eventually the city fell silent, forgotten by the outside world. Today archaeologists are discovering clues to Petra's past. The spectacular objects displayed here, many unearthed by recent excavations, shed new light on this extraordinary desert city. A rose-red city half as old as time; though these words sound like the opening lyrics to a love song, they’re instead penned by a poet and speak of an ancient civilization that carved evidence of their history deep into the soft sandstone rocks jutting toward the soft blue Jordanian skies. Wandering through the miles of sandy roads, the nubby domes of eroded mountains visible in every direction, I was overwhelmed the moment I stepped into this ancient civilization. How did they do it? Why did they carve such beautiful structures into the side of the towering rocks? And I wondered even more, since sandstone is so delicate, why is the evidence still here a full two thousand years later? It was taller than I imagined, and more detailed. Likely carved around 100 B.C.E., the details still etched into the soft sandstone rock speak to why so many myths and stories circulate today. Is there a bounty of treasury hidden under the this carved rock? Some Bedouin through the decades have believed this story and the pockmarked surface from gun shots aimed at the upper Urn speak to a shared yearning and dream for undiscovered treasures. With Nabataean rule, Petra became the center for a spice trade that extended from Arabia to Aqaba and Petra, and onward either to Gaza in the northwest, or to the north through Amman to Bostra, Damascus, and finally on to Palmyra and the Syrian Desert. Nabataean Classical monuments reflect the international character of the Nabataean economy through their combination of native tradition and the classical spirit. But among the most remarkable of all Nabataean achievements is the hydraulic engineering systems they developed including water conservation systems and the dams that were constructed to divert the rush of swollen winter waters that create flash floods. Little is actually known about the Nabataean though, so in my mind I look at smooth columns and eroded statues and imagine the mythological gods and goddess that once adorned the surface. These imagined symbols of Nabataean faith would have jutted life-like out of the sandstone and then journeyed through the day as a riot of colors matching the sun’s movement across the sky. Rose-red in the soft morning light would give way to yellows and browns in the harsh light of midday before a burnt, deep orange would settle over the sandstone gods as the sun took a final bow to the creative imagination and skill of the Nabatea. 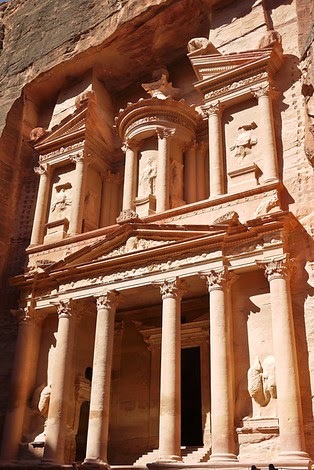 As one of the most spectacular sites in the Middle East, Petra has long attracted travelers and explorers. During the 19th century, the site was visited and documented by several Europeans, after J. L. Burckhardt’s initial visit. A synthesis of the site was published by Libbey and Hoskins in 1905, presenting one of the first overviews in print. Archaeological excavations began in earnest at the turn of the century, with the earliest scientific expedition being published in Arabia Petraea in 1907, by A. Musil. In the 1920's R. E. Brünnow and A. von Domaszewski surveyed the site and published an ambitious mapping project in their Die Provincia Arabia. This survey has since undergone many necessary revisions, the most recent of which was published by Judith McKenzie in 1990. Once impressed with these first sights of Petra, and the fanciful imagining of gods that may have never existed, I moved on to the Street of Facades. Or rather, a parade of carved out tombs, that pale in individual comparison to the Treasury, but when viewed in succession they are gorgeous in their own right.